A common question about Douglas Adams’ famous Hitchhiker’s Guide To The Galaxy is just why Adams chose the number 42 as the answer to life, the universe and everything. In a charming trivia book, author Peter Gill takes 50 pages or so to look into the story of the book and the author and another 250 to find occurrences of 42 in the worlds of sport, crime, science and a wide range of other fields. There are several points at which Gill plays rather fast and loose with the number – notably when talking about cricket, with the quote ‘’The first law prevents the use of 42 fielders, or less specifically all numbers over eleven.’’ Thanks to a bright and breezy writing style, he gets away with this – if he’d been more ruthless about cutting it down to actual 42’s, we’d have lost out on learning about the Polynesian game of kirikiti so I can forgive him for it. Similarly, 4.2 and the football score 4-2 are considered fair game and when it’s used as an excuse to inform us that Geoff Hurst unveiled a statue in Baku to Tofic Bahkramov, the Azerbaijani – NOT Russian! – linesman who gave the goal in that famous World Cup Final, that’s fine by me. Especially since I’ve managed to get at least three pub quiz questions written from that fact. 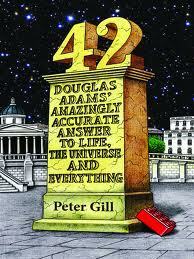 I love Douglas Adams's books. I'll have to check this one out!